Frozen Chocolate flavoured milk made from fresh milk and cream. 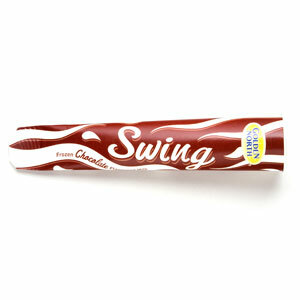 Winner of a Silver Medal at the 2013 SA Dairy Awards, our swings are back better than ever. The ever popular frozen flavoured milks are now available in a convenient new shape and size. The 110ml ‘push up’ tubes make them easy to eat, whilst keeping that same great taste. Available in Chocolate and Strawberry. Storage Instructions: Store at or below -18°C. * Percentage Daily Intakes are based on an average adult diet of 8700 kJ. Your daily intakes may be higher or lower depending on your energy needs. Golden North Ice Cream is a completely South Australian Made and Owned company. Our products are made with only the highest quality ingredients and of course, a lot of love.